Your friends, neighbours and of course yourself are going to be very impressed with the 7’5 x 7’5 Shire Shiplap Corner Shed. The look of this is very unique because of the clever design which will allow it to slot into a corner in a garden. 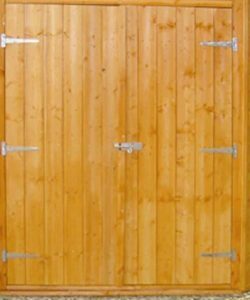 The shed has a set of large double doors which are included as standard. 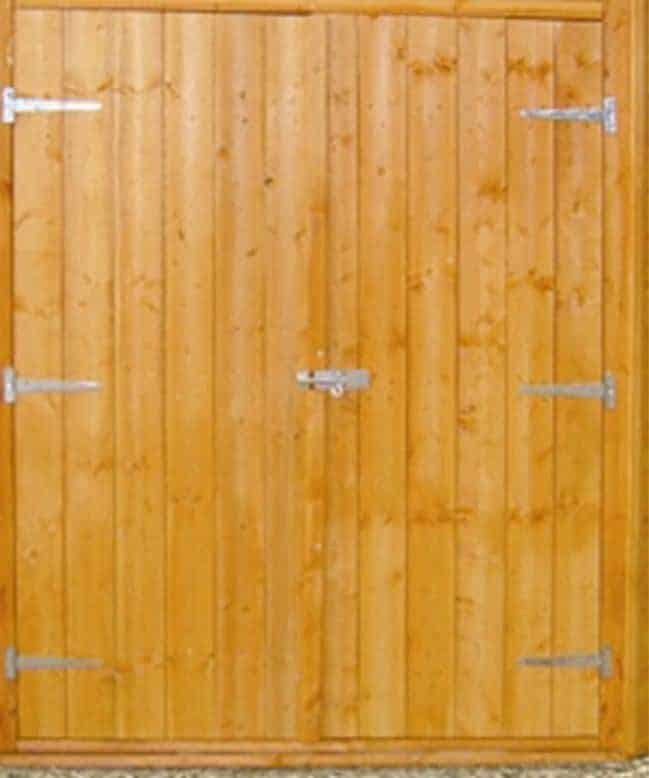 These doors allow you to get large items into the shed with ease and they have a very appealing look to them as well. 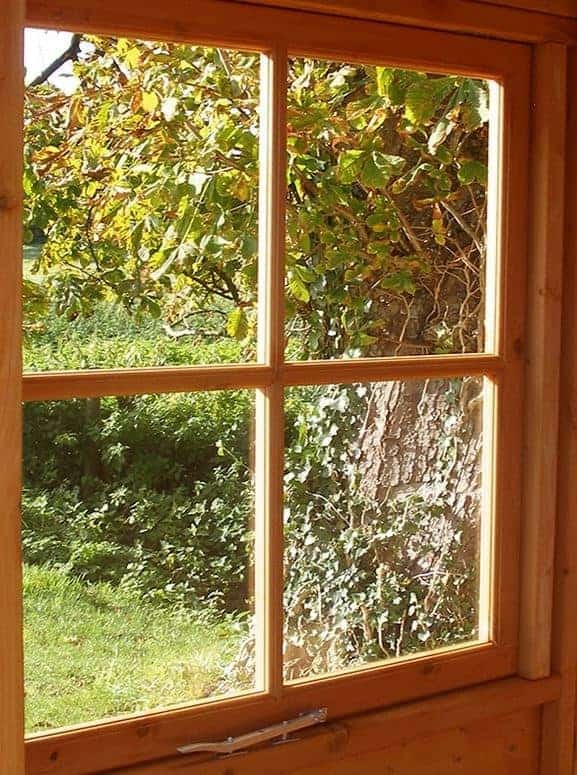 Two glass windows which can be opened add a bit of charm to the shed and also allow a good flow of fresh air inside. 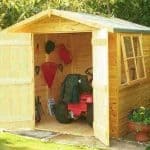 See the top 20 Corner Sheds currently on sale in the UK by visiting the WhatShed Corner Sheds award league table. The materials which have been used for the shed make this one very compact, robust and long lasting structure that also looks gorgeous. 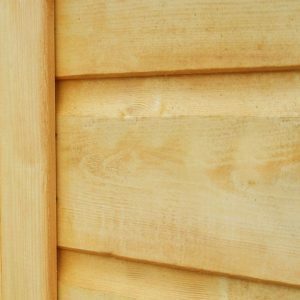 The walls are tongue and groove shiplap cladding and are a solid 12 mm thick. 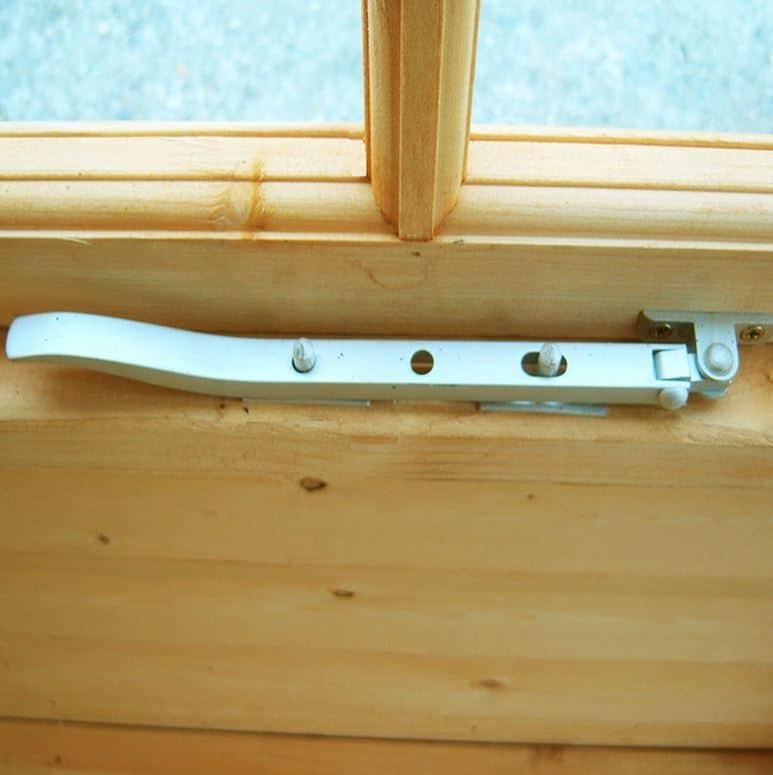 The frame behind these walls makes the shed very firm and will keep it solid for many years and despite this will not get in your way inside the shed. For those of you with heavy items, you will love the floor as it is made with tongue and groove boards and also has 34 x 34 mm, pressure treated floor joists under it. Talk about a shed that has an eye catching design, the 7’5 x 7’5 Shire Shiplap Corner Shed is one of the most intriguing and fun looking sheds we have ever seen. While we do say it is fun looking, this shed still oozes class and has a very high end look to it. 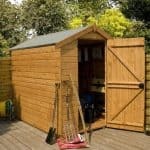 The size of the shed means that inside, you have some very interesting storage space available to you. 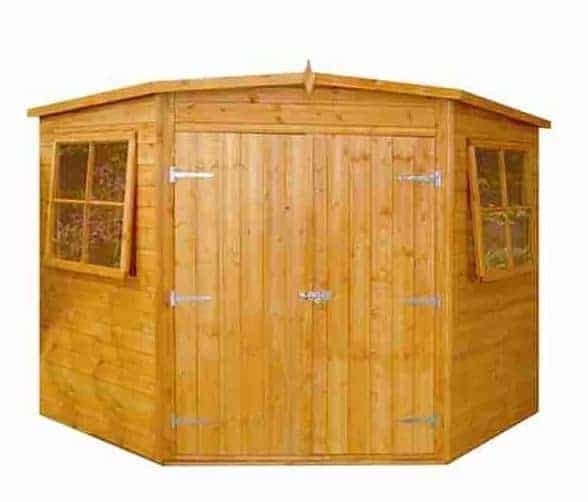 The external width and depth of the shed is 7 feet 5 inches and inside the interesting shape of the shed gives you right around 15 feet of total floor space to make use of. 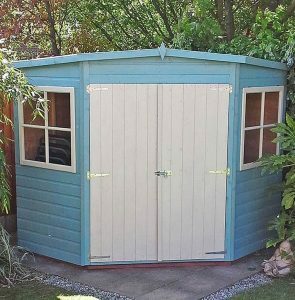 The shed in pictures looks far larger than it does in real life so this would be something that is perfect for smaller gardens or even a garden where you want to place the shed in a corner somewhere. The headroom in here is just over 7 feet at its highest part and then 6 feet 4 inches at its lowest. This is actually quite a lot of height and unless you are really, really tall then you will never have to hunch over while inside here. The roof that is used here is a pent roof and we feel that it works very well with the design and it will of course also keep the rain out. The roof is made with solid sheet boarding and is a very respectable 11 mm thick. We have no issues with the roof at all from a design point of view and also in its robustness. While we are sure some people would have liked to have seen more attractive looking boarding used for the roof, but honestly we feel the boarding, Shire have used takes nothing away from the overall look of the shed. We really do love the 12 mm tongue and groove shiplap cladding that has been used here. The cladding that has been used gives the shed a look similar to a sauna which is really cool and certainly makes this a very unique looking shed. Of course the cladding looks just absolutely incredible, but it is also going to protect your items very well by not allowing the rain to get inside. The shed does have a very lovely look to it, but wow is this one robust and strong structure and that is because of the 34 mm x 34 mm frame which is keeping the whole thing together. An attractive exterior with a very strong interior is what we always want to see from a shed and that is the perfect way to describe what Shire have done here. A good frame quite often goes unnoticed and that is what this one here does, it will keep the shed firm and not get in your way at all. Unlike many other sheds, this one is not using the same boards for the floor as it does for the roof. 12 mm thick tongue and groove timber boards have been used for the floor and these first of all have a very appealing look to them, but also they are strong enough that they can take a whole lot of weight. So if you are using this to store a whole bunch of heavy things then you will be able to do that with ease. Shire are not just leaving the floor at that, under these boards are 34 mm x 34 mm, pressure treated floor joists which make this one of the strongest floors we have seen in a shed for a very long time. The shed will be given a basecoat treatment and this is a very nice touch, but it will not look after the wood in the long run. 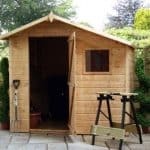 Once you have constructed the shed, you will need to give it a coating of wood treatment, our recommendation is to always do this within a couple of weeks and also once a year after this. A one year warranty is included to protect you on the off chance something does go wrong. This is the same warranty, Shire give with all their sheds and we do wish they would extend it just a little as many other manufacturers are offering 10 and 15 year guarantees with their sheds. Still the materials are so high quality, we do not see you needing to have to make use of it any way. While this is not what we would class as a large shed, Shire have actually still managed to use an incredible set of double doors on here. Off the top of our head we cannot think of another shed this size that offers a double door as standard. The height of the door is, 5 feet 8 inches and the width is a very impressive, 4 feet 6 inches. 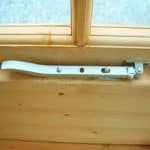 Each door is held in its place with three hinges and a high quality pad bolt keeps them closed. The 7’5 x 7’5 Shire Shiplap Corner Shed comes with two good sized windows, both of which can be opened to allow fresh air into the shed. These windows have a lovely cross frame and are made from 3 mm thick glass. While styrene may be preferable if you have kids playing in the garden, there is no denying that actual glass always looks more attractive, so we are very pleased that Shire have used that here. Unfortunately the shed does not come with any way to actually lock it. Adding a padlock is something you will have to do, but that is not really an expensive purchase or a hassle to install so we cannot be too harsh on Shire for this. Adding a padlock will certainly make this one very secure shed. 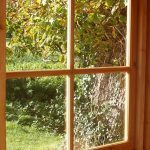 Adding a set of blinds to the windows or even some curtains would make this a very private shed and also look quite nice as well. As it is though, looking through those large windows is very easy to do so there is not much privacy on offer here. This is one amazing looking shed and while we do love the brown standard colour that it is, we have seen this shed be painted in a few more bright and exciting colours, like the blue in the pictures. Paint the shed with a coloured wood treatment and you give it a bit more spark and also protect the wood in the process. 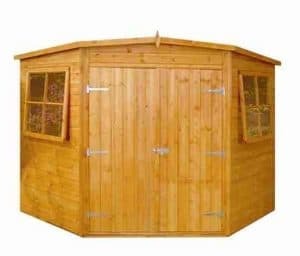 Apart from the padlock and maybe something to cover up those windows, you do not have to worry about buying anything else with this shed. Not having to spend anything more than the asking price is always something we like to see. While this is the type of shed where most of your attention goes to how awesome it looks, we can say with confidence than we are very pleased with how high quality the shed is. The materials used are impressive and with a fresh coat of wood treatment once a year and a little maintenance every now and again, we see this lasting for well over 20 years. Look we really do love this shed, but it is certainly on the small side so that is something to consider before you buy. The shed will come with instructions and taking your time and following them should see you have it constructed in around 6-8 hours. We find that a friend, a kettle always on the boil, some snacks and the radio, make building a shed a much more pleasant experience. 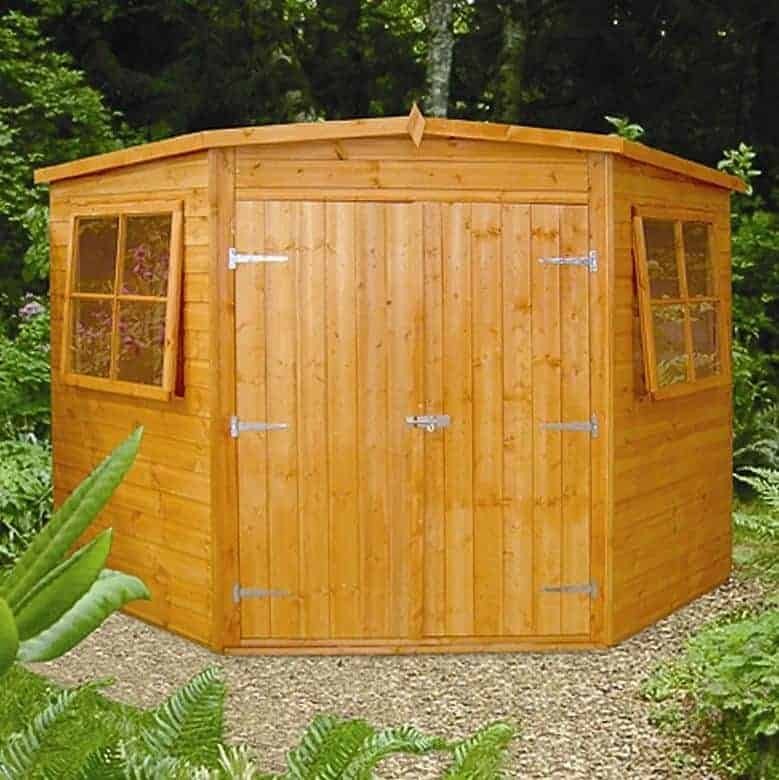 This is a very appealing looking shed and that is why we feel most people will buy it. The size of it is not the best, but if you want something that is going to look good while offering you some extra storage space, we are sure you will be very happy and feel you got great value for your money. Final Thoughts: The 7'5 x 7'5 Shire Shiplap Corner Shed really does stand out from the rest of the crowd thanks to that amazing design. 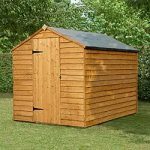 While the shed does have some very impressive looks it is still strong, long lasting and it is also does not require a whole lot of looking after from you. 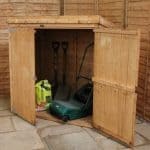 The storage space may not be high, but as a compact shed, we really do love what Shire have done here. While storage is clearly what the shed was intended for, we are sure a few people out there will put a couple of chairs in here, a table and use it as a little place to relax. 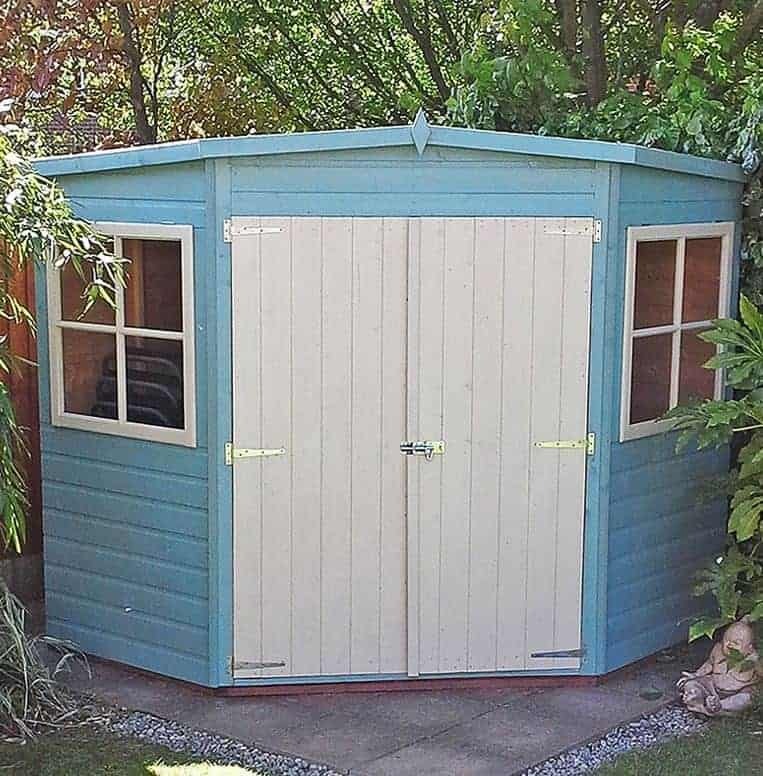 This really is a very lovely shed and something we are sure you could have a lot of fun with no matter what you use it for.